There are several tartans attributed to the clan. The most popular MacLachlan tartan today. First published in Smibert's The Clans of the Highlands in 1850. 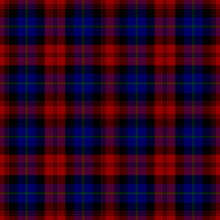 Amazingly, the commonly worn MacLachlan sett of red, blue and black is the second oldest tartan. It was first described in James Logan's Scottish Gael, published in 1831. Logan obtained most of his details from Wilsons so it is reasonable to conclude they were weaving this pattern at about this time. Like the MacNab, this pattern is a red and blue variation of the Black Watch tartan. It may have arisen simply as a color variant by the weavers or at the request of the Chief or a clan member with regimental connections. First published in 1845 in the Vestiarium Scoticum. The Vestiarium, shown to be a forgery, is the source of many of todays clan tartans. The Dress MacLachlan tartan is first described in the 1842 publication Vestiarium Scoticum written by John Sobieski Stuart and Charles Sobieski Stuart, two brothers claiming to be the grandsons of Bonnie Prince Charlie. The reference for the tartan claims its source is a manuscript from the 16th Century. In actuality, the authors themselves generated the referenced manuscript in 1829. Other similar tartans that these industrious brothers first designed include the MacLeod of Lewis and the Barclay. Maclachlan hunting, or Old MacLachlan. First published in 1893. This sett appears in the Collection of the Highland Society, 1812. Although one of the oldest tartans this sett has never been very popular with the clan. It is the oldest MacLachlan tartan actually bearing the name MacLachlan. The sett has been refered to as Old MacLachlan, MacLachlan and Hunting MacLachlan. Although the sett did not appear in books until D.W. Stewart's Old & Rare Scottish Tartans of 1893, there are samples of it in the collections of Campbell of Craignish in 1790 and in the Highland Society of London (circa 1816). Small MacLachlan, or Old Maclachlan, also known as Moncreiffe. 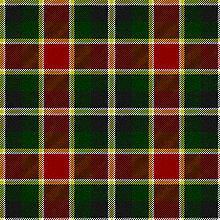 This tartan was in the Wilsons of Bannockburn pattern book of 1790, listed as # 66. Over time the tartan had become associated with the Maclachlans. 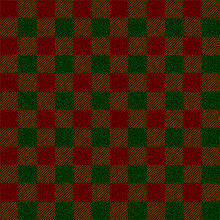 In 1974 the chief of Clan Moncreiffe, Sir Iain Moncreiffe of that Ilk, asked the 24th chief of Clan Maclachlan, Madam Maclachlan of Maclachlan, to be assigned the right to use this tartan, as the colours of it matched the colours in his Coat of Arms. 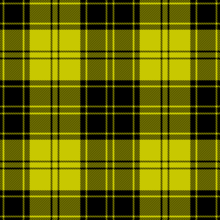 Today it is known as a Moncreiffe tartan.